After having acquired all seven large diamonds, you are presented with the first of three new islands. Like the fifth island, all three of these islands are theme islands. 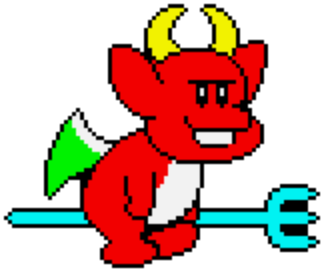 This island is based upon The Fairyland Story, a game which was the spiritual precursor to Bubble Bobble. The game is represented by many of the enemies, as well as the background music. There's no sign of the main character Ptolemy, but every item, hidden or visible, is a 3000 point cake, reminiscent of Ptolemy's ability to transform enemies into cake. Despite the cosmetic changes, your strategy to complete this island should be no different than for the previous islands. Don't stop hunting for the seven small diamonds, as you need the mirrors found at the end of the next three islands in order to get the true good ending. Wizards pace back and forth on particular platforms, occasionally stopping to blast a wave of magic across the screen. Bishops float back and forth on clouds at certain heights, and summon small copies of themselves that ricochet off platforms. They also drop flames to the ground below. If you get too close to them, they attempt to escape by climbing higher. Spectres fly in straight directions, right through platforms in an effort to stop you. Similar to Orcs, Golems bounce from one platform to another. However, they may stop and toss two bombs out in either direction. Caterpillars fly up from the lower left or lower right corners, and arc upward through the screen before falling back down to the middle, ignoring all platforms along the way. The second of the three final islands is an homage to Taito's horizontal shooter, Darius. The typical cartoon inspired enemies and backgrounds are replaced with slightly more realistic images found in Darius. Every round is full of enemies that have made the transfer from shooter to platform game. Surprisingly, the Darius Islands feature the most unique set of enemies that you have faced on a single island. The background music also comes from one of the stages in the Darius series. Hopping robots jump along the platforms, and occasionally stop to shoot a trio of bullets that fan out for a short distance. These squid like float back and forth at certain heights, dropping energy bombs below. They rise up if you get too close. The car shaped vehicles patrol back and forth along particular platforms, and fire lasers from the turret mounted on their roof. The ships that resemble helmets behave a lot like cars, firing orbs of energy forward while they move about. Assault ships spin on to the scene, flying on vector to collide with your current position. Turrets remain stationary, attached to the underside of particular platforms, and fire in whatever direction they face. As one might expect, the orb shaped enemies bounce off of various platforms continuously. Every now and then, they stop and fire six bullets outward. The space craft with flapping wings fly onto the scene, and stop to shoot a bullet at you before flying again and repositioning itself for the next shot. The Electric Fan moves in a similar manner to the Dracula boss on Monster Island. 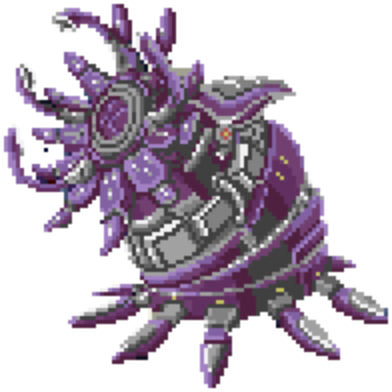 It moves a short distance towards you, then stops to attack. When it attacks, it fires a few laser beams, as well as releasing for small ships. If the ships hit any of your rainbows, they mutually destruct. You can lure the Electric Fan to any portion of the screen and then attack from above. Just don't allow the boss to corner you, or you won't be able to safely escape. This is it, the final island of the entire game. And it is an homage to none other than the precursor to Rainbow Islands itself: Bubble Bobble. For the next four rounds, you will be rising up through iterations of various Bubble Bobble themed stages, connected in one contiguous tower. 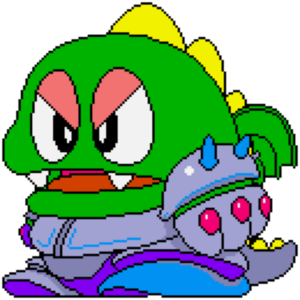 Naturally, the music and enemies will change to that of Bubble Bobble. However, rather than having a peaceful state and an angry state, the enemies in Bubble Island are always angry. Bubbles rise from the bottom of the screen throughout each round. You can jump on them and ride them up to the top. Don't rest easy when you defeat the boss in Round 40. He will soon reveal his true form. Do you have what it takes to receive the true good ending? You'll have to make sure you don't miss out on collecting all seven small diamonds if you want to see it. Zen-chans walk around on platforms, shooting small bubbles out of their mouth in whatever direction they face. Banebous bounce along each platform in an effort to catch Bubblun and Bobblun. Mightas jump around and summon large boulders which they send rolling along platforms. Hidegons wander about, spitting twin fireballs across the screen. Each fireball is capable of destroying rainbows independently. Pulpuls ricochet off of all the platforms, dropping bombs below them while they move about. Monstas ricochet off the platforms, and occasionally stop to fire six white copies of itself out in a circle. Invaders zip quickly back and forth, firing lasers down to the bottom of the screen. Drunks wander back and forth on platforms, occasionally stopping to toss six beer bottles out in a circle. This giant dinosaur in armor wanders back and forth across the screen at a particular height. Like Bub and Bob in their previous game, this dinosaur can spit bubbles from his mouth, and if this bubble happens to catch you, it's game over (if you're down to your last life). Avoid the bubbles at all costs by moving continuously. Get your attacks in whenever the opportunity presents itself. Once you reduce his health to zero, the fight is only getting started. 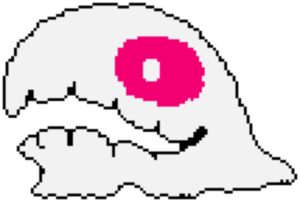 The true form of the boss is revealed, and it's a giant Skel, the white monster who would appear on the screen in Bubble Bobble when you took too long. Skel doesn't attack with bubbles, but he moves quite fast. He alternates between moving horizontally and vertically. Once you destroy him, a giant wand will fall from the sky. Don't take too long collecting it, because the pool of blood when "Hurry Up!!" appears is an instant game over. Assuming you also managed to collect all seven giant diamonds, and each of the three mirrors, you will be treated to the best ending in the game. Congratulations! This page was last edited on 30 December 2018, at 05:37.